With opening night against the Phoenix Coyotes right around the corner, Stars fans will finally get the opportunity to watch some of the new toys GM Joe Nieuwendyk acquired this past offseason. And while some in the Dallas community aren’t too excited that hockey is back, die-hard Stars fans appear to be. Members of the media who have been at Stars’ training camp this week have noted an exceptional fan presence there. As Andrew Monrreal wrote on Jan. 8, there has been a pretty significant shakeup in the Dallas roster. Let’s take a look to where some of those pieces may fit into the Dallas lineup this season. It has been wildly speculated that Loui Eriksson and Jaromir Jagr will be the wingers on the top line, a thought process that was confirmed in the Stars’ first scrimmage of the year. However, the guy who was supposed to be the center there is not the guy who appears in that line chart. That man who is M.I.A is Jamie Benn, who not in training camp because he still doesn’t have a contract. Bob Sturm reported on Jan. 16 that the Stars could be willing to pass up a “bridge contract” for Benn (two or three years to get him closer to unrestricted free agency) and give him a six year (or longer deal). The bottom line here is, if Jamie Benn is not in the Stars’ lineup Saturday, their depth down the middle with take a huge hit. That would force Derek Roy into the top-line center position — a role he would be suited for. The issue there is it would force someone who should be in the bottom six into a second line center role, much like the team had last season with Steve Ott getting top-six minutes. If the Stars get a deal done with Benn within the next 24-48 hours, expect him to be right here, between Eriksson and Jagr. If they don’t, then Dallas could be in a difficult position. Even without the possibility of Benn missing the start of the season, things start to get interesting on the Stars’ second line. Assuming Benn and the Stars get a deal done, Roy will be the second line center. It also appears that newly-acquired Ray Whitney will play one wing on this line. Who plays the other wing, however, still could be up in the air. Based on the line chart presented earlier, it appears that Michael Ryder is the leading candidate to round out the top six. Coming off a career-high 35 goals, Ryder certainly deserves to be there. However, he would be playing with two people he did not skate a single shift with last season. The only person I could see challenging for a top six role right out of the gate would be captain Brenden Morrow. After a season in which he had only 26 points in 57 games, coupled with the fact that him and Whitney generally both play on the left side, probably keeps him out of the top six. However, with the grit of the team having come into question since free agency, due to the loss of Ott and Adam Burish up front, adding Morrow to the top six could be a good change of pace, compared to the primarily skilled games of Roy, Whitney and Ryder. There are multiple different ways the Stars could approach their third line. They could go with a more skilled, scoring third line just as easily as they could go with a gritty, checking third line. If he prefers to have the line pack more of an offensive punch, expect Cody Eakin to be the third line center. 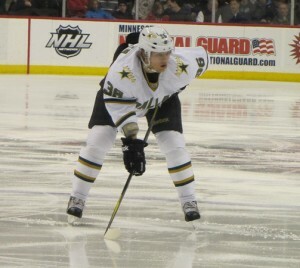 Acquired in the summer’s trade that sent Mike Ribeiro to Washington, Eakin was second on the Texas Stars this season with 24 points in 35 games. If offense is the third line’s primary goal, then look for Reilly Smith to accompany Eakin and Morrow on the third line. After a rough start to the season, Smith was named the AHL Rookie of the Month for December, where he scored eight goals and had 14 points in 14 games. He leads Texas with 25 points in 37 games. However, I expect to see more of a defensive style to the third line, which would mean Vernon Fiddler will likely start the season as the third line center. If Smith is not on the wing opposite of Morrow, expect to see either Tom Wandell or Eric Nystrom, who had a career-high 16 goals last season. If Smith doesn’t make the third line, then I expected he gets sent back to Texas, as playing top-six minutes in the AHL would be more beneficial to him than five-to-eight minutes a night in the NHL. At this point, we’re just playing fill-in-the-blank to round out the forward group. Eakin will likely slot in as the center here, and will be flanked on the wings by any combination of Nystrom, Wandell, Antoine Roussel, Ryan Garbutt or Colton Sceviour. The surprising missing person here is Tomas Vincour, who seemed like a lock to make the team before the AHL season started. However, only 14 points and seemingly uninspired play have kept him down in Austin as training camp opened. The wild card here, as mentioned above, is whether or not Smith makes the team. If he does, I expect it to be in a third line role. If he doesn’t, that likely means Nystrom moves up, opening a spot in the lineup for Roussel, Garbut, Sceviour or Luke Gazdic, who was not invited to camp, but was mentioned by name by owner Tom Gagliardi in a recent interview on Dallas Sports Radio. I’m going to group the entire defense together here as one because it’s as big of a crapshoot as any position on the roster. Since the end of the 2011-12 season, the Stars have let go of three defensemen: Sheldon Souray, Adam Pardy and, most recently, Mark Fistric, who was traded to Edmonton earlier this week. In that same time, the Stars only brought in Aaron Rome, meaning they will be heavily betting on youth this season. The locks to dress as long as they are healthy at this point are Alex Goligoski, Trevor Daley, Stephane Robidas and Philip Larsen. The first three are the only members of the back end that have much experience, and are locked in multi-year deals with fairly decent salaries. Not Shea Weber decent, but enough to warrant dressing every night. Then Larsen is one of the organization’s top prospects who more than held his own in his first full season last year. That leaves two defensive spots open for four players: Rome, Brenden Dillon, Jordie Benn and, most surprisingly, Jamie Oleksiak. Barring a huge surprise the next couple of days, Oleksiak will head back to Texas. He was recalled the other day, following the Fistric trade, when Rome and Larsen had to sit out practice with minor injuries. The 14th overall pick in the 2011 NHL Draft is in his first full season at the AHL, and looks every bit like a future top pair defensemen, but keeping him up now just doesn’t seem prudent. That likely means we will see Rome, Dillon and the older Benn battling for the last two slots. Unless two completely distance themselves from the third early in the season, I expect all three will get a good amount of playing time, particularly with the compact schedule.